Kentucky was only supposed to get 15 minutes from PJ Washington on Friday. The Wildcats’ star player had been out since spraining his left foot back on March 16, in the semifinals of the SEC Tournament against Tennessee. He had missed both of Kentucky’s first two NCAA Tournament games, a stomping of 15-seed Abilene Christian and a close shave against 7-seed Wofford. Hell, even on Friday, Washington’s status was unclear, with an assumption that, if he played, it would be on a 15-minute restriction as Kentucky faced off against Houston in the Sweet 16. He also helped set up the Wildcats’ most important play of the game on the other end of the floor shortly after that, with a massive block on Houston’s Corey Davis Jr. that led to a Tyler Herro three-pointer, putting Kentucky up 60-58 with 26 seconds left; they would not allow Houston to score again. That’s not really what you want to hear from your star player, particularly when the SEC Tournament champions are waiting in the next round: after Auburn dispatched North Carolina in the Sweet 16, the Midwest region has an all-SEC final for a spot in the Final Four. Of course, Auburn will be facing its own star’s injury, as leading rebounder Chuma Okeke had a nasty knee injury that Auburn fears will be serious enough to keep him out of the rest of the tournament, if not even longer. If Washington can bring similar energy on Sunday as he did on Friday, perhaps with a little less suffering, it won’t matter who lines up on the other side. 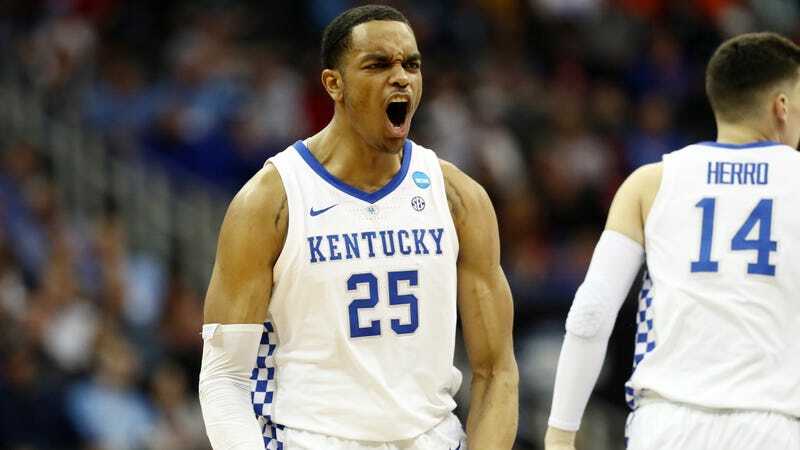 The SEC first-teamer is enough of a force, and the Wildcats rely on him so much, that his return might push them not just into the Final Four, but towards Kentucky’s first national championship since 2012.